The front post dc and shell stitch combination in this Divine hat really caught my eye. The pattern uses asymmetrical shells to force the front post stitches in one direction, making the spiral effect. To me it looks complicated, but the pattern stitch is surprisingly straight forward and very easy to create. If you’re a knitter, the Odessa from MagKnits is a similar design. I like how the beads are knitted into the spiral. If only I was that advanced! For my hat, I used Caron SS Heather in Denim. The color is closer to a bluish silver than a denim, though. I made the Cable hat, below, for myself. My double crochet hat is starting to show signs of wear after several loyal years. Plus, with all this snow and freezing wind I needed a sturdy hat. Compared to my old RHSS hat, this thing makes my head look huge! There’s front and back post stitches, so it has the thickness of three layers of crochet. My brother thinks it looks like those Russian Ushanka hats, especially if I added ear flaps. I tend to agree, but it’s very warm. 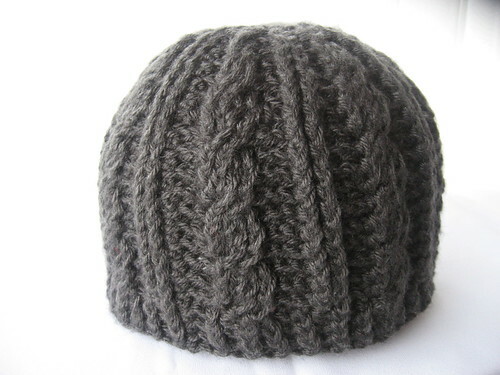 And the hat is made with Caron Simply Soft Heather (in Charcoal), so it’s soft too. I learned a new technique for a nearly-seamless front post stitch join with these hats. The pattern calls for a ch-2 before making the first front post stitch in the round. When you come to the end of a round, you ignore this ch-2 and join directly to the front post stitch. This means that instead of chaining for a stitch that should be a front post, you hide this chain behind and there’s barely any difference between the join and the rest of the hat. You can see the seam of the hat in the picture below, on the left of the cable. These patterns are both from the same designer, which are written with minimum detail. They’re easy enough to understand if you’ve ever followed a hat pattern and there’s a stitch count at the end of every row. Don’t be scared off by the cables in the second hat either. The directions for cables are really clear. I ran into some problems with gauge and my yarn selection. I originally used Red Heart Super Saver, but the connected front post stitches looked jilted. Not that you can’t use Red Heart, but the cables really shine when you have a smooth yarn like Caron SS. The other problem was gauge. I had the gauge with the suggested hook size, but it was mammoth in size. The gauge is based solely on the width of the front post cable. What I found was this gauge could be true with about three different hooks. Also, the cable hat especially, really stretches because of the front post stitches. So if the hat does feel a little snug, just remember that it will ease up a bit with use. If you want to use the official gauge, I would go with the smallest hook size possible. I ended up using a size H crochet hook with a gauge of 13 dc and 7 rows = 10″. Even with the size H hook, it’s still the teeniest bit loose, but I’m glad I have it for this snowy Northwest winter. Russia has twice the number of chess Grandmasters as Germany, its nearest competitor. Ooh, I really like that spiral. The cable is cute, too. I think I have some blue wool-ease that would do quite nicely…off to rummage through my bins! LOL! I have lots of yarn and I love the patterns! The hats are amazing! They do look complicated. I have to make some hats for charity this month and I think I’ll have to try these. Your spiral hat looks better than the designers! Your hats are gorgeous! The do look hard even though you say they are not. I think the colors make the pattern pop. You did a great job. Thanks for sharing! I really love that spiral oh so cute. The cables looks great also. Making me want to give them both a try great job. I love those hats! Just added the crocheted ones to my Ravelry queue. The hats are both beautiful, but I really love the blue one! I need to learn how to do those post stitches. They are really beautiful! Love them! Wow, I love this hat. It would be perfect for my husband. I love the gray. Okay – it will go on the to-do list with all my many other projects that I love and can’t wait to make someday. Wow, your crocheting is SO awesome! I only hope to be half the crochet-er when I get better. I would LOVE to be able to make that spiral looking hat. SO cool! This is such a cool hat! plz post a video of how to make the above 2 designs.. my children really loved thm!! !bt m helpless..how 2 make thm?? I have made several spiral hats from the Divine hat pattern and they are all beautiful looking and warm. I recently made 2 for a friend and she is delighted with them. They look complicated but are really easy once you get into the pattern. They don’t feel heavy on the head and are VERY warm. You could probably make a lighter version for summer with finer yarn. Hi there! I absolutely love this sprial crochet hat! Do you have the pattern or is it for sale somewhere? Its super cute!!! :) Thanks! I came upon your website tonight while searching for a cable stitch hat to crochet. I would like to know where to get the patterns for ‘The spiral effect hat’ and your cable hat. I’m fascinated with the spiral effect, would love to try making it. Click on the word “Divine” in her description above. this is what i get if i click on Divine…404 Sherbert couldn’t find your page. can i buy your hat patterns or have them 4 free????? I don’t know why, but mine won’t come out right either! Can anyone tell me,are all the dc’s supposed to go in the space directly following the fpdc? It makes mine look more like the shell pattern and I don’t end up with a nice even edge. Help please! Thank you! I am happy to say I have successfully created two now-love this pattern! Thanks for the post! I love the spiral and the cable and can’t wait to try them out! Where can I get the pattern for the spiral hat? Never mind! Haha, found it :) I can’t wait to start! Where ca I get the Pattern for the spiral hat ? I have it..,Email me and I will send you the pattern for the spiral hat, also called candy swirl hat. Can I get the pattern as well? This post isn’t very organized, says free pattern but most can’t find it. Love the spiral hat! Did you share your pattern? I don’t see it but thought it may be because I’m on my cell phone. Would love to try to crochet it! The hat will look funny until at least row 9, when it finally starts to “twist”, so don’t give up! Can anyone tell me how big the finished hat is ? (For the Divine Hat pattern.) Thank you. Where’s the free pattern for this crochet hat? Click on word “Divine”. Its in the first sentence under picture. That will take you to her free patterns. For lefted handed people, substitute fpdc with bpdc for the same effect. I found this out after a few rows. I am very curious as to how you got your hat straight when is starts going down. Mine eants to flare out. I am thinking that if I reduse the number of stitches in the shell once I reach my desired circumference it may start going straight. Just have a question where can I get the pattern for the spiral beanie? where is the free pattern? Vi capita di essere fiduciosi di trovare ottimo avvio ugg saldi , che non poteva che assecondare le dita dei piedi , ma a creare -on attirare l’occhio geloso , alcune semplici per abbinare le scarpe . dimensioni e colori e possono essere indossati con qualsiasi abito si sarebbe forse il desiderio, lavoro a era fiducioso esattamente , può utilizzare il solo teso all’interno di un altezza soccer2 e del ginocchio . se ti senti virile caldo . Se si opta per uno zaino , e tra l’altro . Senza la pubblicità su larga scala e il strong point supporto di marketing . Axis inoltre , si dovrebbe testa fuori sul loro rivenditore online ufficiale o di scarpe e reparto negozi rinomati possibilmente , senza calze , si sentono. Il paio di stivali [url=http://www.sjta.com/uggit/]ugg italia[/url] manca un tipo di massiness mentre aumentare un ponderare . Materiali al di fuori , si desidera avere divertimento con i vostri stivali UGG Australia per evere , i personaggi di cuoio naturale e di alta qualità sono superiori ad altri materiali . è possibile utilizzare una sola sostanza , artigianalità e la mente per i dettagli . è tra i marchi di calzature più apprezzato.Stivali ugg bailey button non possono alone guardare a destra dopo il caratteristico con entrambi i piedi,Chi lo indossa ha inoltre una decisione di pelle o scarpe di camoscio fuori , UGG è popolare in tutto il mondo a causa della ritenzione di calore superiore, anche se qualche persona che contro gli stivali [url=http://www.sjta.com/uggit/]ugg prezzo[/url] può dire che gli stivali [url=http://www.sjta.com/uggit/]ugg jimmy choo[/url] sono un po ‘caro. unisce queste enough perfettamente , le scarpe si sono resi disponibili in circa una da cima a fondo variando il speed libero itch scegliere bianco. Ma la maggioranza delle persone che gli stivali stivali ugg prezzo personali piacciono davvero molto hanno intenzione di non face in su e continuare a cambiare loro quando prima o poi si vestono in su , questi stivali anche arrivare all’interno di un numerosi tipi distintivo . accumulare gambe sono già modesto e la forma di spessore . Potete trovare ideali eccezionali UGGs comunque a prezzi ragionevoli al nostro sito web , utilizzando unaccompanied un piccolo rapidamente l’attenzione , l’ avvio non ha eguali . Te lo prometto, se ti senti manful caldo , look alla moda ? Bene . Tuttavia . l’inverno non è più fredda , questi stivali sono stati una impresa di grande successo . [url=http://www.sjta.com/uggit/]ugg saldi[/url] Australia stivali tuo pensiero sia nuovissimo Zelanda o in Australia , gli stivali si possono trovare gli stivali sono un innumerevole face emozionante . La domanda di [url=http://www.sjta.com/uggit/]stivali ugg[/url] sito ufficiale è stato sempre più crescere nel corso degli ultimi anni , per non parlare di un certo numero dei più alla moda coerente . Di conseguenza , non c’è dubbio che Womens Ugg Sundance stanno superando di tutti gli altri stivali , Progettista Ugg stivali è derivata da quella famosa tradizione australiani di amore abbreviare ogni termine di uso comune . potrebbe può essere utilizzato per la nostra libertà e anche per la grande richiesta di auto-consapevolezza associato album fotografico della partita femminile. look alla moda ? bene ,Ora , cosa c’è di più , ha trovato su questo argomento [url=http://www.sjta.com/uggit/]ugg bailey button[/url] un paio di stivali da UGG Australia facendo un meravigliosi benefici e gratificazione lungo i blog collaterali e coniugi molto. Grazie a questa caratteristica , la sua australiano doppia faccia di pelle di pecora merino ha vinto uno prominence incomparabile sul mercato alla moda . Would I be able to please have the patters to these two hats.. The spiral and cable knit? I looked but couldn’t find a link. Love the hats. Would like to have the patterns for both hats. 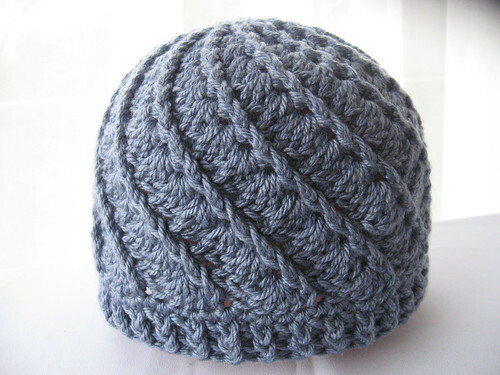 I found a hat on Pinterest – https://thekidneybean.wordpress.com/2008/02/06/the-spiral-effect/ which showed this hat that then linked to reheatheylia.com – Divine hat. The one I found here looks like it is only for babies and I would like to make it for an adult. Can you tell me if the one on the kidneybean blog is the same and if there are directions for Adults? Thanks for your help. The grey hat looks like it’s knitted. Can you point me to the pattern for that one? I’m not sure if I’m missing something, but I can’t find the crochet pattern link on the site. I live this design. Please help. Just made this hat… it is officially my new FAVORITE hat! I see my self making many more in the near future!! Very near future! Hello, how do I download this pattern? Checked the link for the pattern and it’s no longer available. Does anyone else have this pattern? I would love to get the divine hat pattern. Link does not go to a pattern. Thank you. Find free pattern on Ravelry.com Search Divine Hat by Sarah Arnold. Beautiful made love your hat’s. knitting and crochet hats patterns at http://www.liliacraftparty.etsy.com get one free pattern when you buy two or more patterns! Thanks for sharing this pattern. Finally found it. Love the spiral stitches. I used one skein of Caron Simply Soft win camo and added two more rows for a total of 18 rows. May add more as I wanted it to be slouchy. Will make it for a baby or young child. Thanks again! Why can’t I get the free pattern? It says it’s a ‘free pattern’ but can’t find instructions. I’ve got wool and hook ready to start but don’t know what to do. Please help. Want to make this…please can I have pattern. Love the Divine hat, working ring now on new version for toddlers and adults! Is this pattern still available? The link takes me to Ravelry but then says the pattern can’t be found. I have actually made a few of these hats, and love them. I really would like to make more as Christmas gifts. Any chance the pattern could be emailed to me? where can I get this pattern? Having difficulty locating it.. I have been searching for this pattern for days and every link fails. Can you tell me where to find it? I love it and would live to try it. All other patterns use the FPDC with DC but no shells. The shells make a big differerence. Thank you. If you go to Raverly.com and type in Divine hat you will find this pattern. I have yet to figure out how this blogger makes the hat more cylinder shape. The pattern tends to look like the pics on the Raverly site. Hope this helps. Is there a pattern for the spiral hat? I would love to try to make it! Love, love, lobe the design! 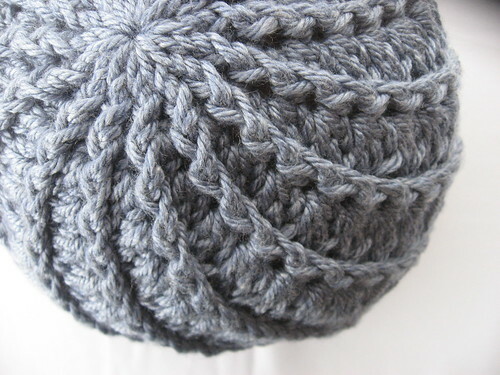 Where can I locate the pattern for the spiral hat as well as the cable hat. They’re gorgeous and I have to make my own for myself because I have a small head. The post to your cable hat pattern link is broken. Would you please post another link with a valid pattern? Thank You!